The Lions football team poses after beating McNeese State University on “Senior Day” 23-6. The players wear uniforms sponsored by athletics’ partnership with Adidas. At the university, Athletics partners with Adidas to provide the sports apparel for the official university teams. In 2008, Athletics inked a contract naming Adidas the Official Athletic Apparel Provider for the university through 2021. For football, each jersey costs over $100. With over 100 current players and multiple styles, this can add up quickly. With the combinations of green, gold and white, another thing that is unique to the football uniforms is the fit of the material. However, problems like durability arose with the tight fit uniforms. Different uniform combinations can be worn on game days. 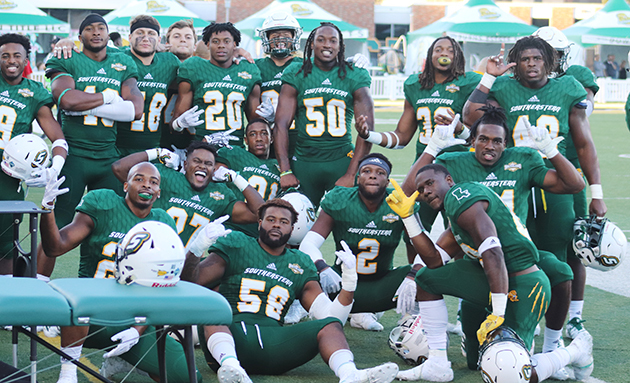 The football team wore white pants and jerseys for the game against Northwestern State University, white pants with a green jerseys for the game against Houston Baptist University, and green pants and jerseys for the game against McNeese State University. The players are also satisfied with the deigns of the uniforms.